Guide to Nimble Well's rental inventory. Overview of Nimble Well's rental inventory, the largest collection of cake stand for rent in the Midwest, and large collections of vintage glassware, trays and tabletop decor for weddings, showers, and special occasions. 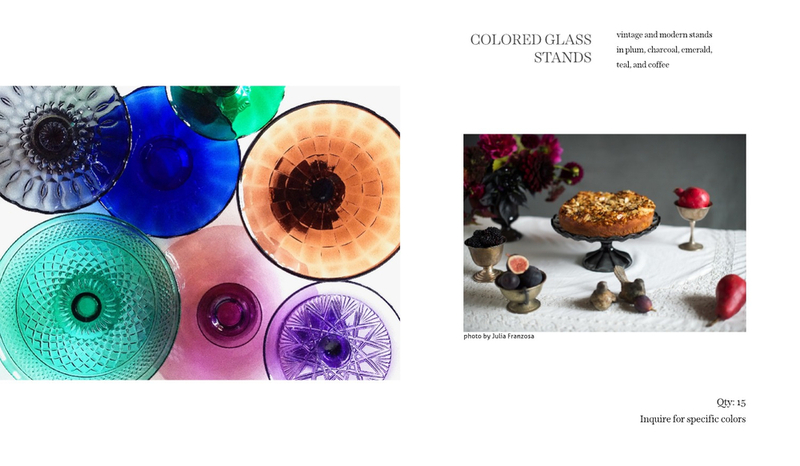 Nimble Well has over 400 vintage colorful glasses in our rental collection for events in the Chicago area. Nimble Well's all-matching vintage pink coupes for champagne toasts and signature wedding cocktails. Beautiful for weddings, and bridal and baby showers. Nimble Well rents vintage cake stands in shades from petal pink, to peach and coral. Available for weddings and events in Chicago. Milk glass cake stands in pink, blue, and mint green. Rent for sweets tables for weddings, baby showers, and special events. Vintage gold cake stands for wedding sweets tables in Chicago. Vintage amber cake stands for fall wedding sweets table from Nimble Well vintage rentals in Chicago. Rent cake stands for dessert tables in green, purple, violet, cobalt, and charcoal for a gorgeous sweets table for your wedding or party. Nimble Well has a large collection of Victorian cake stands available for rent in Chicago for wedding, shower, or bat mitzvah sweets tables. Nimble Well has the largest collection of cake stands to rent in the Midwest, including vintage and modern milk glass cake stands. Modern Black Walnut and Corian cake stands for inspired savory or dessert tables. A large assortment of choice milk glass vases and compotes for weddings, showers and special events in Chicago. Vintage bottles available for event rental from Nimble Well Chicago vintage rentals. Brass, silver, and copper vases and compotes for rental from Nimble Well Chicago vintage rentals. Nimble Well has over two dozen vintage mirror plateaus available for wedding and event rental in Chicago. Vintage dishware and trays in silver, pewter, glass, and natural wood from Nimble Well Chicago vintage rentals. Natural Black Walnut and Hickory trays for savory and sweets table displays for wedding and event rentals. Add depth and dimension for savory and sweet tabletop food displays with custom wood boxes in weathered gray and warm brown from Nimble Well Chicago tabletop rentals. Exclusive to Nimble Well, our collection of Liberty of London print napkins for dinners, showers, and special event rental in Chicago. Contact Nimble Well Chicago vintage and unique tabletop rentals in Chicago, your source for cake stands, dishware, trays, vases and all the vintage and unique rentals you cannot find elsewhere.